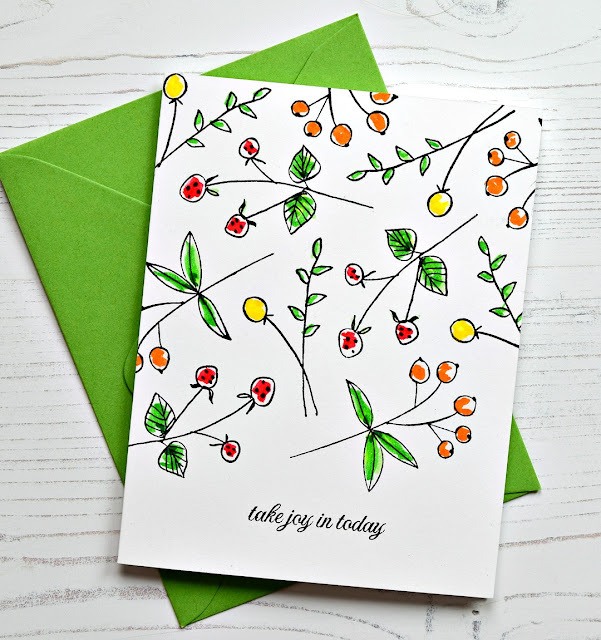 A sweet, simple, card to brighten someone's day. Stamps are from Altenew's Beautiful You and the sentiment is from a Clear and Simple set called Butterfly Garden I. Used Versafine Onyx and a few Zig Clean Color brush pens. MOOD WHEN DONE = hanging in there! I'll be back later in the week with an update on my visit to the specialist in Boston. Still processing! Beautiful card! Hope the specialist provides you with the guidance you need that will give you peace of mind. Sending hugs; hope you have room for them in your luggage! You're so good with these Altenew stamps. You've chosen sets which are just perfect for you. Love this all clean and simple with the sparse coloring. Again, with the envelope, too. It's so much a part of the card and I love it! I'm curious about your Dr. visit and will be watching for word. I'm loving everything you're doing with Altenew! So fresh and refreshing. Love how you've coloured these stamps. Very edgy. :) Hope your news will be happy and that you're feeling better soon. I'm a huge Altenew fan but somehow I have always overlooked this set. I love the card you made with it. Thanks for bringing my attention to it!